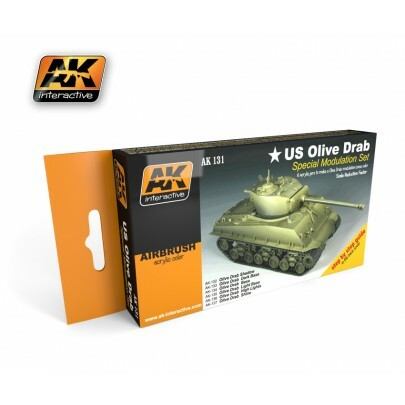 American vehicles in WWII used an Olive Drab color to paint their vehicles. This set allows modelers to paint their models with special modulation effects. Modulation effects obtain light and shadow tones with subtle variations while not changing this special Olive Drab color. This set is the easiest and quickest way to apply color modulation to your models. These are acrylic paints so you can thin with water or AK Interactive Acrylic Thinner. These paints can brushed or airbrushed on to your model. For best results, use AK Interactive Acrylic Thinner. Like with all AK Interactive products, it is essential that you thoroughly shake these bottles of paint until the color inside of the bottle becomes uniform with no separation of colors. 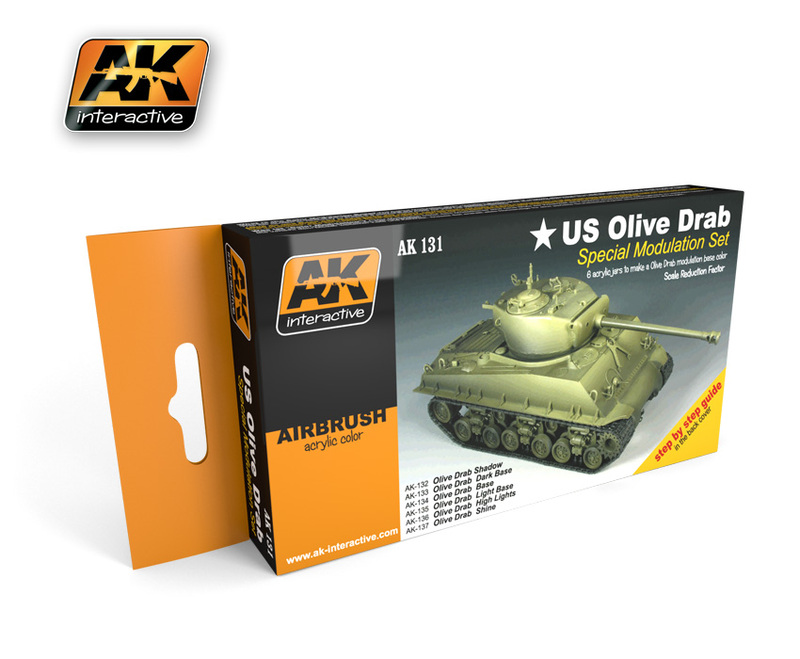 Olive Drab Modulation Set American vehicles in WWII used an Olive Drab color to paint their vehicles. This set allows modelers to paint their models with special modulation effects. Modulation effects obtain light and shadow tones with subtle variations while not changing this special Olive Drab color. This set is the easiest and quickest way to apply color modulation to your models. These are acrylic paints so you can thin with water or AK Interactive Acrylic Thinner. These paints can brushed or airbrushed on to your model. For best results, use AK Interactive Acrylic Thinner. Like with all AK Interactive products, it is essential that you thoroughly shake these bottles of paint until the color inside of the bottle becomes uniform with no separation of colors.